Not all of these sandwiches are created the same In fact, some people have no idea what they are. (GASP). I know, right? When I become an eastie, (moved to NJ) I wanted a hot beef sandwich. I was missing home and wanted some HOME food. Not pizza, no cheesesteaks, just as my husband calls it, "farm food". Well, we went to our favorite diner, (shout out to Golden Palace in Vineland, NJ) and ordered a hot roast beef sandwich. When it arrived, it was roast beef, swimming in gravy on a toasted hoagie roll. Ok, it wasn't what I was planning, but, hey, it was as close as I figured I would get, so I enjoyed every luscious bite! When my husband asked what was different I said, "Where are the potatoes? Where is the sandwich bread?" He was not nearly as concerned as I was but, to end this story on a positive note, I did find a hot beef sandwich that slightly resembled my most coveted treat from home. You were holding your breath, weren't you? Make sure to make a batch of mashed potatoes to serve along side of this delicious sandwich, from my childhood and from, well.......dinner tonight! In your slow cooker, add your roast. Sprinkle over onion powder, poultry seasoning, dried parsley, salt and pepper to taste. Add in beef stock or water and bouillon cubes. Place the lid on and cook on high for 6 hours. I normally like my roast beef medium, but for this you want it well done. Don't mess with it just let it go. When your roast is done, remove unto a platter. 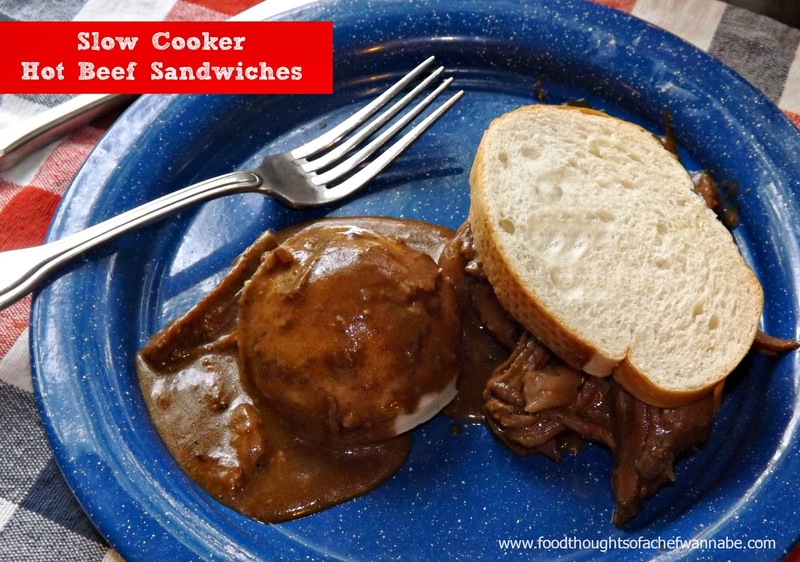 Leaving your slow cooker on high! Now, to the stock left in your slow cooker, add in flour, butter and Kitchen Bouquet, and whisk that goodness until it is glossy, and thickened. Slice your roast beast and then slide it back into the gravy. Place on warm until you are ready to serve. Make a sandwich, add a side of mashed potatoes and your carb heaven has arrived! This is perfect to make extra and freeze for later!